In 2013 (year for which all data are in), the growth of pay-TV and other digital platforms within the European video landscape continued at a steady pace, says TONY GUNNARSSON, Analyst with IHS. Physical video still dominated consumer spending, but the decline in physical consumption has had severe adverse effects on the physical home entertainment in Europe. By the end of 2013, European consumers had spent a total of €8.5 billion buying and renting physical and digital video, including DVDs and Blu-ray Discs (BD) as well as video consumed via digital and online platforms and services. DVDs and BDs are still the preferred method of paid-for video consumption, accounting for more than 77% of total video spending. European consumer spending on DVD/BD fell for the ninth consecutive year ending 2013 at €6.5 billion, down 11.56%. The largest sector of European video spending continues to be the buying of DVDs and BDs. DVD and BD retail spending fell by 10.6% in 2013, to €5.8 billion. Spending on DVD and BD rental declined by 19.6% over 2013 to €31.2million. Spending on video through digital platforms and services rose by 42.8% in 2013, to a total of €2.0 billion ? ?including transactional (paid for at the point of consumption) and subscription TV-based video-on-demand (TV VOD), and digital retail, rental and subscription services accessed via computers and Internet connected devices. The largest generator of digital video spending is still TV VOD, worth €773.0 million (a near identical figure to the DVD/BD rental market) in 2013, although growth is slowing down - in 2013, the market increased by 12.6% compared to an increase of 19.6% in 2012. The strongest growth area for digital video is the consumption of video via digital subscription services, characterised by online services such as Netflix, Amazon, Canal Play, HBO, etc. Consumer spending in this area increased by 147.8% to reach €521.5 million in 2013. Digital subscription is now the second largest area of digital video overall (after TV VOD). However, transactional digital rental also experienced strong growth: digital rental increased by 43.1% to €287.5 million in 2013, while digital retail ended the year at €375.0 million, up 37.0% in 2013. Consumer spending on the physical video market peaked in 2004 and, despite the introduction of the BD format, it has declined steadily ever since. The home video market has developed considerably over this time and the consumption of video is no longer the sole preserve of video discs. The result of this decline has meant that in recent years Europe has seen widespread closures of video retailers and rentailers. This has left some European markets with a much reduced, or entirely absent, store-based video specialist sector through which consumers can buy or rent DVDs and BDs. The reduction in physical video purchasing is partly due to the transformation of the European video retail and rental environment which has so far benefitted non-specialist retailers such as supermarkets as well as online retailers at the cost of traditional video specialists. More recently, some European consumers have switched from transactional consumption of video to paying a fixed monthly rate for subscription services offering mostly catalogue films and TV content. Furthermore, the launch of free-at-the-point-of-consumption TV catch-up services which allow consumers access to recently broadcast film and TV content has also had an impact on the market. New release titles on DVD and BD continue to be as popular as ever for many Europeans, whereas sales of catalogue titles have declined drastically, due to the lack of physical shelf space and the increasing numbers of digital services. However, there is still a sizable consumer group that continues to buy discs for their convenience, collect discs and maintain film libraries; buying DVDs and BD as presents is also still very popular, and the gifting of discs continues to be highly popular particularly through the Christmas period. In 2013, the UK remained the largest of the European video markets as well as the worlds? third video market after the USA and Japan accounting for 29.5% of total consumer spending on video in Europe (physical and digital combined). In 2013, the UK video retail environment once again underwent significant changes. Entertainment specialist retailer HMV was faced with the threat of bankruptcy in early 2013, but was bought by restructuring experts, Hilco, and continued to trade albeit with a reduced UK store count. Video rental chain Blockbuster UK began the year with significant financial problems also resulting in the company being sold to private investors, before finally closing altogether at the end of the summer. Consumer spending on buying and renting DVDs and BDs in the UK declined by 10.1%, falling to €1.9 billion by year end 2013. Spending on DVD retail declined by just 9.7% (to €1.4 billon) compared to a rate of decline of 13.9% in 2012. Spending on BD ?retail increased by 10.0% in 2013, mainly due to the sale of HMV's excess stock. However, the direct impact of the Blockbuster closure in 2013 led to a 33.3% decline in consumer spending on physical video rental (€174 million in 2013), and to a much reduced video rental store base, now consisting of a relatively small number of independent video rental stores. Renting DVDs and BDs by mail remained a strong market in the UK, dominated by Amazon's LoveFilm brand. However, the sector did not increase noticeably as a result of rental store closures. The declines recorded for the overall rental market in 2013 resulted in the UK no longer being the largest physical home entertainment rental market in Europe. The German rental market, despite declines in 2013, can now claim that accolade. Growth in the UK came from digital video and TV VOD services, a combined area that experienced an increase of 50.3% over the previous year, ending the year at a total of €634 million. For the second year in a row, digital subscription was the fastest growing area of digital video, increasing by 123.7%, generating €233 million in consumer spending. The continued popularity of Netflix and Amazon means that digital subscription is now the largest platform for internet delivered video (worth 37% of total digital video, or 9.3% of total UK video market). With continued growth across all digital video and TV VOD platforms, non-physical video is representing an increasing share of total UK video spending, accounting for more than a quarter (25.4%) of the entire video market in 2013 - compared to less than a fifth (16.9%) in 2012. Thanks to the growth in digital video, overall consumer spending on video in the UK - combining both physical formats and digital platforms - was flat year-on-year at €2.5 billion (+0.1%). 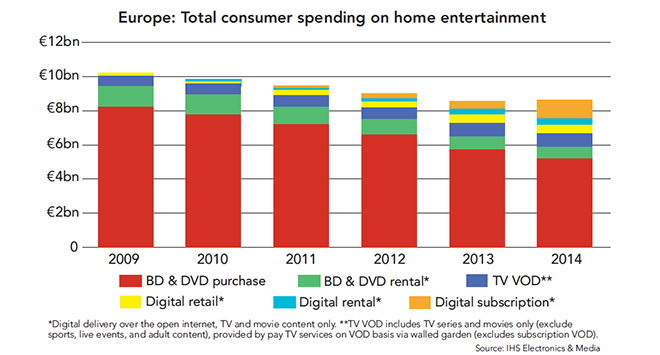 Germany's home entertainment market did much better in 2013, recording growth across both physical (+1.3% overall) and digital video sectors (+54.2%). This resulted in an annual growth of 6.6%, at €1.9 billion overall. Spending on physical video retail in Germany has been stable at around €1.4 billion since 2009. The reason for the continued success of packaged video in Germany is partly due to the fact that the physical market continues to be well promoted and supported by the key consumer electronic retailer Media Markt, but mainly the lack of competition generated by Pay TV service distributed PVR/DVR set-top boxes. Combined German digital video and TV VOD only accounted for 15.0% of Germany's total video market in 2013 - compared to 25.4% in the UK and 22.7% in France. The biggest area of spending on digital video in Germany is TV VOD, at €77.5 million, followed by digital retail and rental at €82.0 million and €81.0 million. Here as well digital subscription is the fastest growing sector having increased from €19.9 million to €45.9 million in 2013. The entry of the online subscription service Netflix in Germany in the second half of 2014 is likely to further expand the German online market. For France, the third largest video market in Europe, 2013 was another year of declines, with overall consumer spending falling 12.2% to €1.23 billion. Driving the decline in the French video market is the rapid decline in spending on physical video: spending on the purchase and renting of DVDs and BDs dropped by 16.5%, to €0.95 billion in 2013. At the same time, growth for French digital video and TV VOD has slowed down - overall the digital video market grew by just 6.49% (to €278 billion). TV VOD accounts for an important share of the French digital video market: at €148.1million, the sector generates 53.7% of digital video spending in the market. The French online market is characterized by a growing number of online subscription services such as Vid?o Futur, FilmoTV, CanalPlay (Canal+), Mubi etc. The UK has maintained its share of European video spending at 29.5% in 2013, despite recent declines. Germany's share of European video spending grew to 22.5%, while France?s share declined to 14.5%. For the rest of Europe, 2013 was also a year of strong declines for the physical video market. In Italy and Spain, historically the fourth and fifth largest European markets, the rate of decline in spending on physical video was 9.7% and 13.1% respectively. In Italy, spending on digital video and TV VOD recorded a decline in 2013 of 7.4%, to €69 million (representing 20.9% of the total Italian home entertainment market). Note however, this is due to a definitional change in reporting; Mediaset, an Italian pay-TV operator, withdrew its digital subscription service, instead bundling the service with its traditional pay-TV subscription service (not accounted for within this report). Other areas of the comparatively small digital video market in Italy grew significantly, but as a relatively small component of the market, their growth is masked by these changes. In Spain, despite widespread online and physical piracy, the digital video market continued to grow - up 27.2% in 2013, to €44 million (19.6% of total spending). In Benelux total spending on video fell to €482.8 million in 2013, a decline of 8.3% compared to 2012. The combined Benelux DVD and BD market declined by 19.9% to €335 million, though as elsewhere there was growth in digital video and TV VOD, up 37.0% to €147 million. The Nordic markets - Sweden, Norway, Denmark and Finland - generated a combined 9.9% of total European video spending in 2013. While all four markets experienced declines on the physical video market in 2013, with physical spending falling by 23.5% to €606 million, strong growth in digital video and TV VOD ensured that video as a whole only declined by 6.6% in 2013, to €842.3 million. The popularity of digital subscription in the Nordic region has impacted on the region's physical business: Nordic digital subscription spending grew by 266.9% to €148 million in 2013, meaning that digital subscription now represents 17.6% of total spending on both physical and digital video across the region. DVD and BD rental across Europe has again recorded steep declines in 2013. Total spending on physical rental in Europe declined by 18.6% to €730 million, representing about half the recorded value of the market in 2008 (€1.4 billion). As in retail, DVD is the dominant format for physical rental, accounting for 79.1% of all spending on video rental in Europe last year. But the declines are also affecting the BD rental market ? as spending on DVD rental dropped by 22% overall (to €577 billion) while BD rental was down by 0.9% (to €152 million). The UK has historically been the largest video rental market in Europe, but, following the declines and closures previously noted, the UK market now accounts for a smaller level of spending than Germany. UK consumer spending on renting DVDs and BDs in 2013 declined by 33.3% (at a fixed exchange rate) to €173.8 million - approximately half the size of the UK rental market in 2007 (€363 million). Meanwhile, the German video rental market also experienced a decline in 2013, albeit at a lower rate of just 4.9%, to €224.9 million overall. The UK now accounts for 23.8% of European spending on video rental, versus Germany at 30.8%. The Nordics make up the third largest rental market in Europe at a total of €125.2 million, or 17.1% of total European video rental spending, but here too the rate of decline has accelerated in 2013, down by 15.8% year-on-year. Elsewhere in Europe, the physical video rental markets in 2013 were also characterised by significant declines. The area of video rental that historically has been less affected by the downward trend, rent-by-mail, has in recent years seen many smaller rent-by-mail companies close. The European rent-by-mail market leader, Amazon's Lovefilm, opted to exit unprofitable markets such as the Nordics in 2013 to focus on its digital subscription strategies. As a result of this and the closure of video rental stores across Europe, consumers are increasing finding it difficult to access DVD and BD rental. The three largest video markets in the world - US, Europe and Japan - together accounted for 87.4% of total consumer spending on physical video in 2013. Europeans spent €6.5 billion ($8.7 billion) buying and renting DVDs and BDs, generating 29.4% of worldwide physical video spending. Consumers in the US accounted for 41.8% share of total video spending worldwide. In 2013, US consumers spent less money buying and renting DVDs and BDs than in 2012. The combined US domestic DVD and BD spending dropped by 10.1% to $12.4 billion (€9.7 billion) in 2013. This reflects declines across both physical video retail (down 9.3% to $7.9 billion) and physical video rental (down 11.5% to $4.5 billion). Contrary to the European home entertainment market, US consumption of BDs continues to grow at a faster pace: BD generated 24.6% of total US DVD and BD spending in 2013 compared to 21.8% in Europe. In 2013, US consumers spent $3.06 billion buying and renting BDs, an increase of 1.1% over 2012. However, spending on DVD fell by 13.2% to $6.4 billion. As regards digital video, US consumers spent a total of $5.0 billion on digital retail, rental and subscription, which represents a third of the total US video market by value. As in Europe, digital subscription is the largest area of spending at $3.1 billion last year, generating more than two thirds of total digital market and one fifth of the total US video market. A further $1.9 billion was spent accessing video content through pay-TV VOD platforms. The world's second largest video market continues to be Japan, representing a share of 16.2% of physical video spending worldwide in 2013. In comparison to the US and ?Europe, Japanese consumer spending on physical video was more stable, with total spending on physical video dropping by just 4.4%, to $4.79 billion. Japanese physical video continued to benefit from its resilient video rental market, which last year accounted for over half of the total Japanese video market (50.9%). In contrast, video rental only generates 11.1% of total physical spending in ?Europe (36.4% in the US). Compared to the US and Europe, Japan?s digital video and TV VOD markets are still relatively nascent. In 2013, Japanese consumers spent $339.8 million on digital video and TV VOD overall, which equates to just 6.6% of the total Japanese video market. Total spending on video on both physical and digital platforms ended at $5.1 billion in 2013, down by 4.2% compared to 2012. In 2014, the combined European physical and digital video market is expected to stabilise with digital growth expected to play a larger role. While sales of the DVD format are expected to continue to decline in Europe, the continuing growth of BD households in Europe is expected to result in a modest increase in spending on BD retail. The physical rental market is expected to diminish further in Europe and the result is likely to be that video rental will become far less accessible for many European consumers. The launch of new digital subscription services in major European territories in 2014 is expected to boost the digital subscription sector. Growth in transactional digital video is expected to continue and though the rate of increase has started to slow down, the increasing size of these market segments are expected to contribute positively to the total video market in Europe. This is one of several editorial features included in the DVD and Beyond 2015 magazine, now available. Ask for your free copy.